Beautycounter — Caroline Zwickson, M.A. >>> the average woman uses 12 personal care products every day containing 168 different chemicals. >>> studies have found an average of 200 industrial chemicals and pollutants in umbilical cord blood of newborns with a total of 287 chemicals. Of those chemicals, we know that 180 cause cancer in humans or animals, 217 are toxic to the brain and nervous system, and 208 cause birth defects or abnormal development in animal tests. >>> the European Union has banned over 1300 chemicals from being used in personal care products. The U.S. has banned 30. What we put ON our (& our children's) bodies is just as important as what we put IN our bodies. "Caroline, what products do you use on your skin? What brands do you trust & use on your boys?" While I have read hundreds of labels and tried dozens of products I never had a clear, simple answer that I felt 100% confident with... until I came across Beautycounter. Watch this video to understand why we all deserve better. Beautycounter doesn't just make fabulous skincare and luxurious feeling makeup at affordable prices, but they are here to make a change. 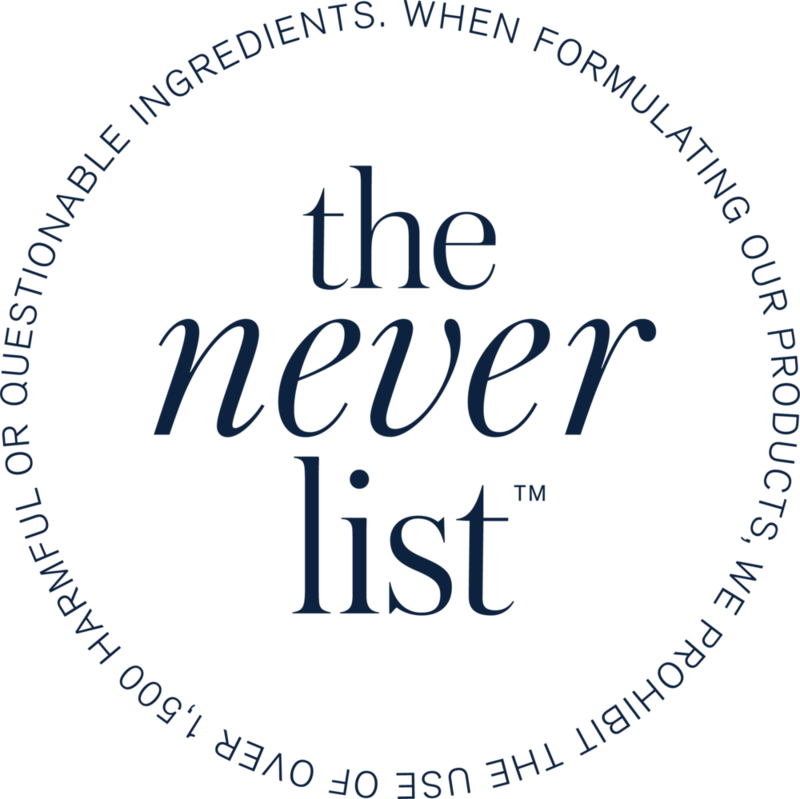 Beautycounter is committed to health and safety standards that go well beyond what’s required by U.S. law: They’ve banned the use of more than 1,500 questionable or harmful chemicals (which are on their "Never List"), all while ensuring their products perform. What I also love about Beautycounter is that they are dedicated to making changes on the legislative level, taking action in Washington and working to reform the current laws and regulations to make personal care products safer for you and your families. Yes, I want to try saver + high performing skincare! It took me a long time to find a skincare line that really works with my skin, giving me enough moisture without leaving me oily. I also love that all of the Beautycounter products have a neutral, clean, very light scent (finally no overpowering smells), are easy to apply and make me feel luxurious. Personally, I like to keep my makeup simple, natural and easy. As a mom, my time in the mornings is limited and I find that these essentials -either the Flawless in 5 set or the 5 separate items- work perfectly while adding a little color and glam. If I am careful with the products I use on my skin, I am extra careful with what I put on my boys. OPTION 1: BECOME A CUSTOMER. Make the switch from whatever you are using now and up your skincare game by choosing better beauty for you and better health for your whole family. OPTION 2: BECOME A MEMBER through our Band of Beauty membership incentive program. *Make sure you select “Caroline Zwickson” as your consultant. Make sure you choose me, Caroline Zwickson, as your mentor, get your Enrollment Kit and any special enrollment product packages you want to try. Then lets get in touch. I'd love to have you on my team. "I am not interested in jeopardizing my health for the sake of beauty or turning back the clock. I am mom. My health matters too much." I'm here to help. Just email me at Caroline@carolinezwickson.com and I'll answer any questions you have about Beautycounter, what joining option is best for you, or which products might suite your needs the best.